Derry City and Strabane District councillor Derek Hussey has condemned those who caused upheaval in Sion Mills by placing a suspicious object in a well populated residential area of the village. 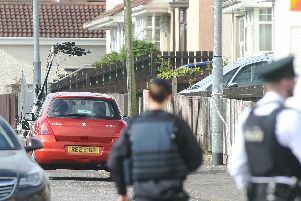 The UUP Alderman slammed those responsible for the alert after the PSNI confirmed that a number of homes had been evacuated following the discovery of the suspicious object. He said: “A lady living at the home where this device has been left has served the Sion Mills community well for many years and continues to do so. “I have spoken to community representatives who are quite rightly dismayed and angry that such an action would be undertaken in their area. “It was typical of the lady herself that when I spoke to her she was more concerned about the upheaval that her friends and neighbours found themselves having to endure than the immediate situation that she and her family had found themselves in. “Those who would engage in such an activity have no place in our society and I would urge that anyone with any knowledge of usual activity in the Sion Mills area during the night and morning should contact local police.